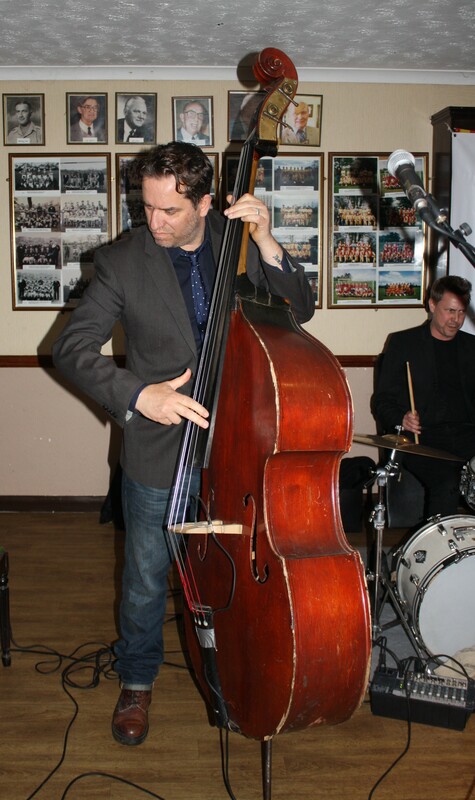 Ben Martyn (double bass) leads his own band ‘Martyn Brothers’ (Dominique Coles on drums) at Farnborough Jazz Club (Kent) on 15th April 2016. Photo: Mike Witt. 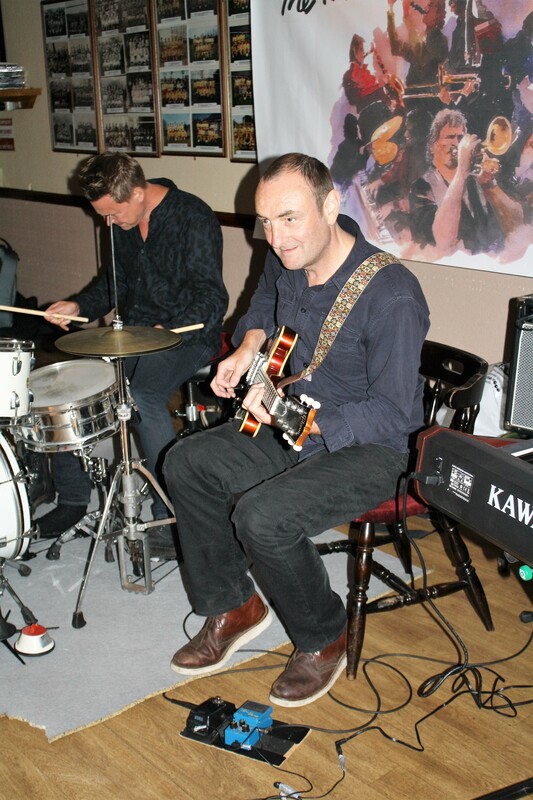 JOHN ‘flashback radio’ RUSCOE on guitar & Dom Coles on drums in the Martyn Brothers Jazz Band on 30th June 2017 at Farnborough Jazz Club. Photo: Mike Witt. 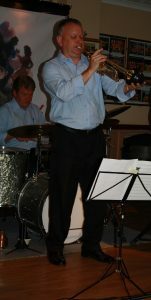 The MARTYN BROTHERS JAZZ BAND will be charging the air again at our FARNBOROUGH JAZZ CLUB on Friday, 22nd June 2018. 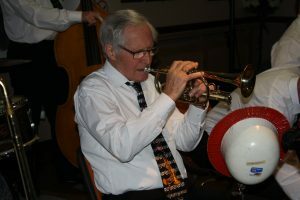 BEN MARTYN (double bass &vocals) had booked Alan Grestie to play, but poor Alan was taken ill and hospitalised with a serious flu bug this week, so Ben has booked one of my favourites, ROB PEARCE on trombone. 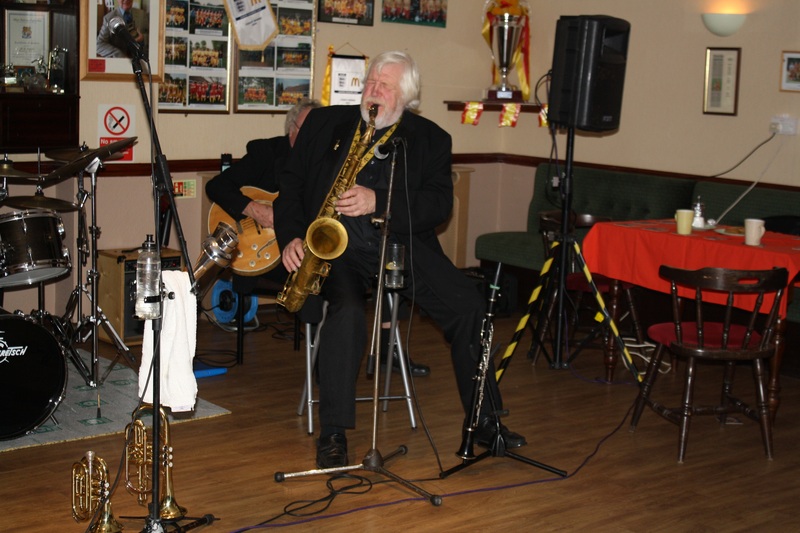 A bit of a different sound, liken to The Louisiana Five Jazz Band of the 1920’s (only the second band to ever record their music) – should be a great evening. Rob, just like Ben, travels frequently back and forth to New Orleans, so sure to give his all. 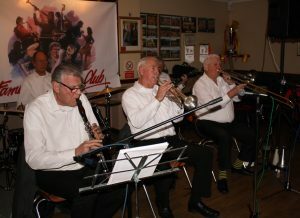 They will be joined by RICHIE HOWARD (clarinet), DEAN ROSS (piano) [sorry no photo of Dean as yet], JOHN ‘flashback radio’ RUSCOE (guitar) and DOM COLES (drums). 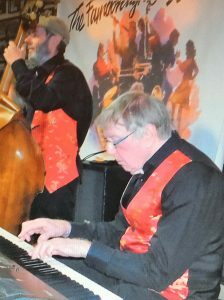 They are very popular in central London clubs and show their versatility, although certainly play the real New Orleans traditional style jazz for us here. 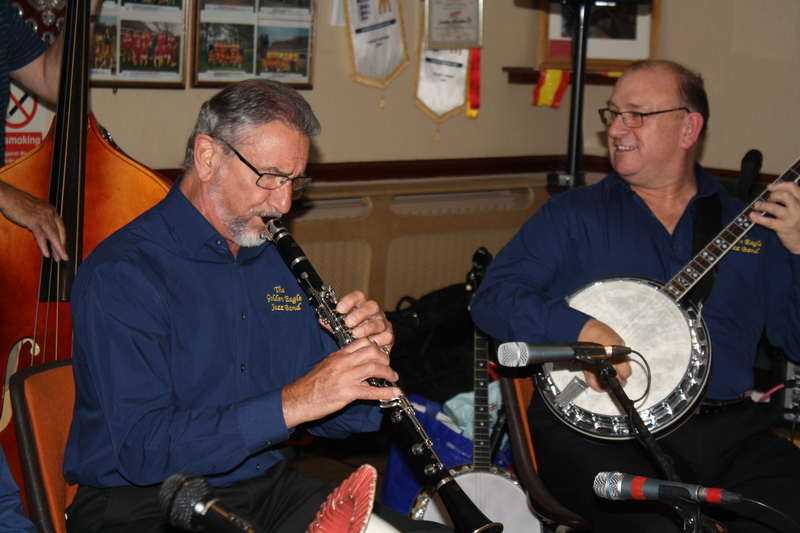 Regulars and newcomers, come and see what fabulous young musicians they are and enjoy a couple of Shepherd Neame pints at the same time, soaking in the atmosphere. 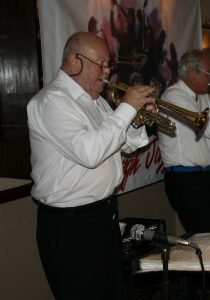 The music is from 8:00pm till 11:00pm (plenty of free parking). Richie Howard (cl) & Dom Coles (drums) with Martyn Bros at Farnborough Kent 15jan2016 Photo by Mike Witt. P.S. ‘4-In-A-Bar+1’ are performing at Ye Olde Whyte Lyon, Locks Bottom this Sunday, 24 June 2018, from 3:00 till 6:00pm (see special ‘Page’ at top of our website about it). 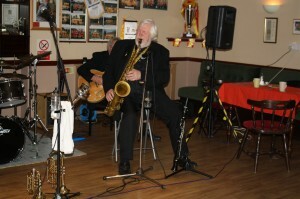 An excellent venue, where appetising Sunday roasts can be enjoyed, whilst being entertained with dinner jazz. 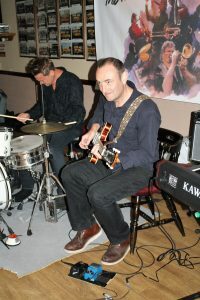 This month, Tim is unable to play for us, as he has a charity gig he does every year. But we have an equally talented guest pianist, Alan Berry. You have got to come to listen to us, we really are good. Remember three weeks ago, we were booked for a lovely couple’s (Donna and Kenny) wonderful wedding at Leeds Castle (Kent). Their wedding was just as expected, so beautiful. I was very proud of ‘my boys’, they certainly were the business. 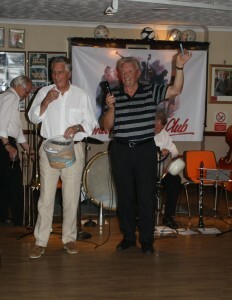 They looked very elegant too, in their DJ’s AND I don’t remember making any faux pars with my singing either. 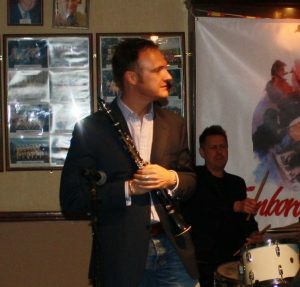 John Lee on tenor sax seen here with Laurie Chescoe’s Reunion Band at Farnborough Jazz Club, Kent UK. Photo by Mike Witt. 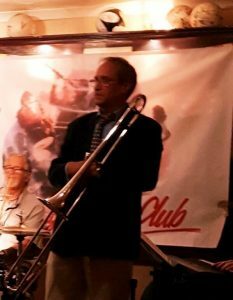 This entry was posted in Martyn Brothers Jazz Band on June 20, 2018 by Diane. Lord Napier Hotshots play at Farnborough Jazz Club (Kent) on Friday 26th February 2016. (LtoR) Bill Traxler (drums) Pat Glover (clarinet), Mike Jackson, (trumpet), Lynn Saunders (banjo) and Mike Duckworth (trombone) (luv the yellow & black striped socks). Photo by Mike Witt. 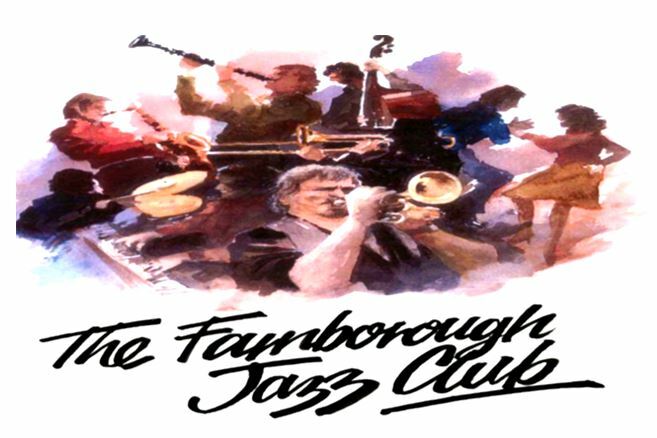 The ‘LORD NAPIER HOT SHOTS’ are returning to the fold here at FARNBOROUGH JAZZ CLUB tonight. Friday 15th June 2018. The musicians will be MIKE JACKSON (trumpet), PAT GLOVER (clarinet), MIKE DUCKWORTH (trombone), LYNN SAUNDERS (banjo), BILL TRAXLER (drums) and PETE CLANCY (double bass). I had a quick look back and was reminded they kindly agreed to cancel their last gig here, because that Friday, (2nd March 2018), we had severe snow. Oh! 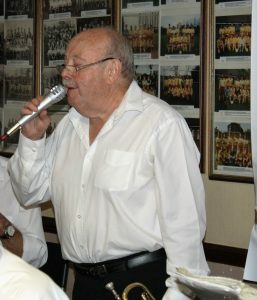 and by the way, we have only closed a maximum of three times over three score years, not bad aye! But I’m sure it is going to be a lovely evening, see you all for a swinging time. If you haven’t been before, don’t feel nervous to come and join us, we only eat people on a Saturday. This entry was posted in Lord Napier Hot Shots on June 15, 2018 by Diane. 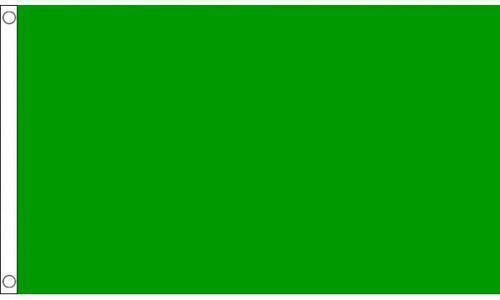 This entry was posted in Uncategorized on June 14, 2018 by Diane.